Mercury, a silver-colored liquid metal, is extremely toxic to the nervous system and may impair the way we see, hear, walk and talk. When spilled, mercury can evaporate at room temperature and the vapors cannot be seen, smelled or tasted. In the environment, mercury can be converted into a form that is especially toxic and can build up in fish tissue. Because of its potential to pose long-lasting health and environmental risks, mercury has become a high-profile toxic waste. Removal of mercury switches from vehicles before crushing is an important part of managing the dismantling process. Some vehicles may contain no mercury components, while others may contain several. Vehicles built for sale in the US from the year 2002 and later do not contain mercury switches. Additionally, fluorescent light bulbs used in lighting the facility contain mercury. Fluorescent Bulbs and Mercury Switches should be Recycled as Universal Waste. On August 5, 2005, federal rules required that mercury-containing equipment requiring disposal are considered Universal Waste (40 CFR 273) and, therefore, are exempt from the more stringent management standards for hazardous waste under the federal Resource Conservation and Recovery Act (RCRA) if recycled. Once removed from the vehicle, mercury switches must be stored in a leak proof, closed container that will prevent the mercury capsule from breaking. Generators of mercury switches cannot accumulate the waste for more than one year. Each container that holds mercury switches must be labeled accordingly (i.e. “Universal Waste”). Along with clearly labeling the contents of the waste containers, identify the length of time the waste has been accumulated. This can be done simply by adding the date that the first switch was placed in the container to the label. Store spent fluorescent bulbs in a sturdy container to prevent breakage during accumulation, storage, and transportation. Label the storage container “Used Lamps” and mark it with the date the first bulb was placed in the container to document the one-year time limitation. Provide proper training to employees responsible for the storage of used lamps (i.e. storage, labeling, etc.) and capture and contain all accidental releases from broken lamps with the same care as other hazardous waste. Recycle used lamps through a bulb recycling facility. The recycler will provide storage containers upon request. Maintain the shipment record until disposal is completed. 1. Does the facility generate mercury switches? 2. Are mercury switches stored in closed, non-leaking containers? 3. 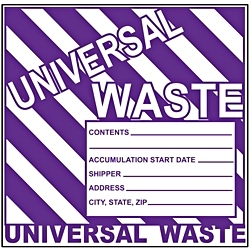 Is the container labeled “Universal Waste”? 4. Does the facility generate fluorescent light bulbs (or other mercury or halide containing) lamps? 5. Are "Used Lamps" stored intact in non-leaking containers? 6. Is the container labeled “Universal Waste” and "Used Lamps"? 7. Are all Universal Waste recycled annually through a Universal Waste Handler? Most regulations tell you what you have to do to be in compliance, but they don't explain how to do it. That's where "best management practices" come into play. BMPs are proven methods that help you to get into compliance and stay there. All employees who handle mercury-containing products (switches and/or fluorescent bulbs) should be informed of proper handling and emergency procedures for these products and for mercury. Remove all mercury switches from the vehicle as soon as possible. Be careful not to break or puncture the mercury-containing device such as light bulbs during removal. If a mercury-containing device breaks, at a minimum, the device, the released mercury and cleanup debris should be sealed in a plastic bag and transferred to a closed compatible container labeled "Hazardous Waste" (with a description of the contents) and managed as a hazardous waste. Store mercury switches in a leak-proof, closed container. Store in a way that will prevent the capsules from breaking. Label storage containers with "Universal Waste" and or "Spent Bulbs" or "Used Lamps". Be able to demonstrate that you have not had the devices stored for more than one year. This can be done by labeling storage containers with the accumulation start date. Recycle mercury switches and/or bulbs with an Universal Waste Handler that reclaims mercury. 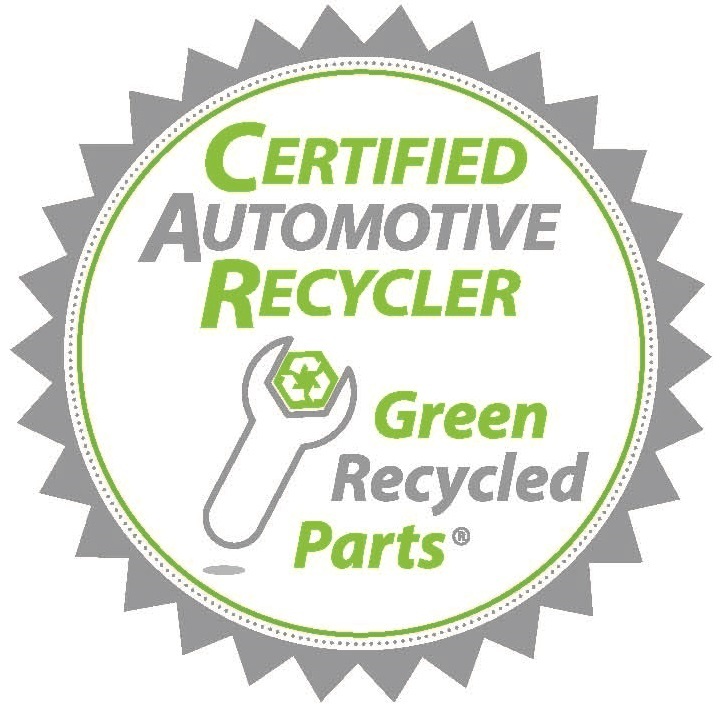 In late 2006, the Automotive Recyclers Association (ARA) became a partner in the National Vehicle Mercury Switch Recovery Program (NVMSRP) which was designed to dispose of mercury switches removed from scrap vehicles before the vehicles are flattened, shredded, and melted to make new steel. One of the NVMSRP goals was to maximize switch collection nationally. A $4 million fund was established that was used to reward auto recyclers in the participating states on a first-come, first-serve basis over a 3-year period for their efforts in recovering convenience light switches. Free disposal was also available for ABS system switches. The NVMSRP voluntary incentive fund was depleted as of July 2009. However, FREE DISPOSAL continues to be available for mercury switches through the ELVS program. On December 16, 2016, the Steel Manufacturers and ELVS reached an agreement to continue the ELVS program through December 31, 2021. In a statement from Executive Director of the ELVS Program, Mary Bills, said "As most of you are aware, the NVMSRP program is ending on December 31, 2017. We are pleased the new agreement ensures that the ELVS program will continue to be made available to automotive recyclers on a nation-wide basis. We look forward to working with our partners, SMA and AISI, in our ongoing effort to responsibly recycle automotive mercury switches."